Prints up to 20 pages per minute in black and 16 pages per minute in color. Designed to fit tight spaces and budgets. Designed to fit tight spaces and budgets. Printer is simple to set up and use right out of the box. Measures: 4.9"H x 16.8"W x 8.5"D.
Includes one 60-sheet paper tray. Features 4800 x 1200 dpi maximum color print resolution and 1200 x 1200 dpi black print resolution. 1,000 sheet monthly duty cycle. Media Size Letter - 8.50" x 11"; Legal - 8.50" x 14"; Envelope No. 10; Photo - 4" x 6"; 5" x 7"; 8" x 10"; A4 - 8.30" x 11.70"; B5 - 6.90" x 9.80"; A6 - 4.10" x 5.80"; DL Envelope - 4.30" x 8.60"; Custom Size; 3.50" x 5"; 8.46" x 10.98"
Print the documents you need in a snap. 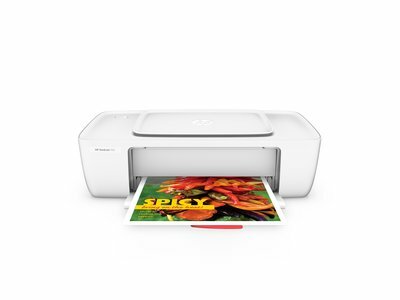 Designed to fit tight spaces and budgets, this printer is simple to set up and use right out of the box. Count on high-quality prints while also conserving energy with a printer that’s ENERGY STAR® certified. Print easily—right from the start. Get set up fast and create exactly the documents you need. Add this printer to any room. The compact design takes up little space, so you can use it wherever you choose. Keep costs down, without sacrificing quality. Print everything from coupons to school projects—right from your home. Get reliable results with every page. Easily recycle your Original HP ink and toner cartridges for free. Ragnar1948: The printer does exactly what I wanted it to do and it's speedy as well. Windows 10, 8.1, 8, 7: 1 GHz 32-bit (x86) or 64-bit (x64) processor, 2 GB available hard disk space, CD-ROM/DVD drive or Internet connection, USB port, Internet Explorer. Windows Vista: 800 MHz 32-bit (x86) or 64-bit (x64) processor, 2 GB available hard disk space, CD-ROM/DVD drive or Internet connection, USB port, Internet Explorer 8. Windows XP SP3 or higher (32-bit only): any Intel® Pentium® II, Celeron® or 233 MHz compatible processor, 850 MB available hard disk space, CD-ROM/DVD drive or Internet connection, USB port, Internet Explorer 8. Input voltage: 100 to 240 VAC (+/- 10%), 50/60 Hz (+/- 3 Hz). 1 Program availability varies. Original HP cartridge return and recycling is currently available in more than 49 countries, territories, and regions in Asia, Europe, and North and South America through the HP Planet Partners program. For more information, visit http://www.hp.com/recycle.